When it comes to cilantro, both the flat, waxy leaves and the stems are flavorful and edible. Though cilantro may be similar in looks to Italian parsley, the pungent aroma and taste of cilantro is incomparable to any other herb. It is a necessary ingredient of many Mexican, Asian, Indian, Caribbean, and North African dishes and one of my personal favorite flavors. Fresh cilantro is available year-round and is usually found in the produce section of most markets next to the bundles of parsley. Find a bunch of upright, crisp cilantro with out any yellow or wilted leaves. Fresh Cilantro can be stored in a moist (not wet) in a plastic bag for up to one week. 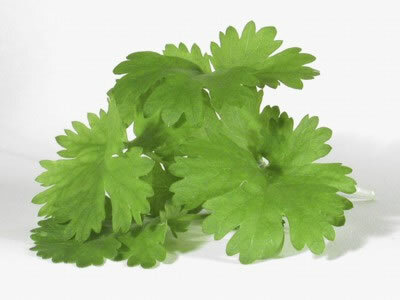 Cilantro can be kept crisp and fresh in the refrigerator by placing the stems in a jar of water and placing a plastic bag lightly around the leaves. The best way to wash cilantro or any bundle of herbs is to submerge them in a deep bowl of cold water. Allow enough time for dirt or sand to settle at the bottom and herbs to float clear. Then remove cilantro and rinse with plenty of cold water. Blot herbs dry with a paper towel and let sit for a few minutes to allow excess water to soak into the paper towel. For the most attractive cilantro, pull leaves from stem gently by hand. Since the stems are as edible as the leaves, cilantro can also be chopped. Here is just one of many fabulous cilantro featuring recipes for you to try. Toss lime zest, lime juice, and cilantro with cooked rice. Serve warm or cold.